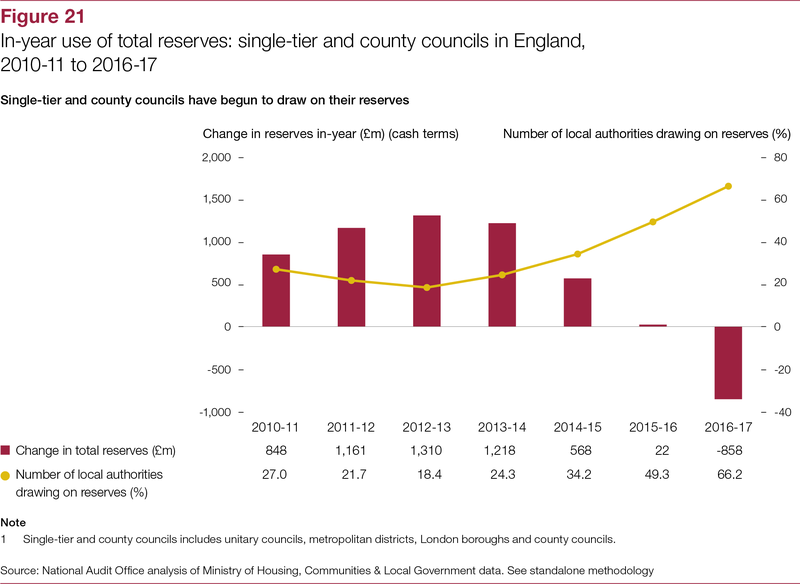 Part One sets out the financial and non-financial challenges faced by local authorities since 2010-11 and examines how they have responded. 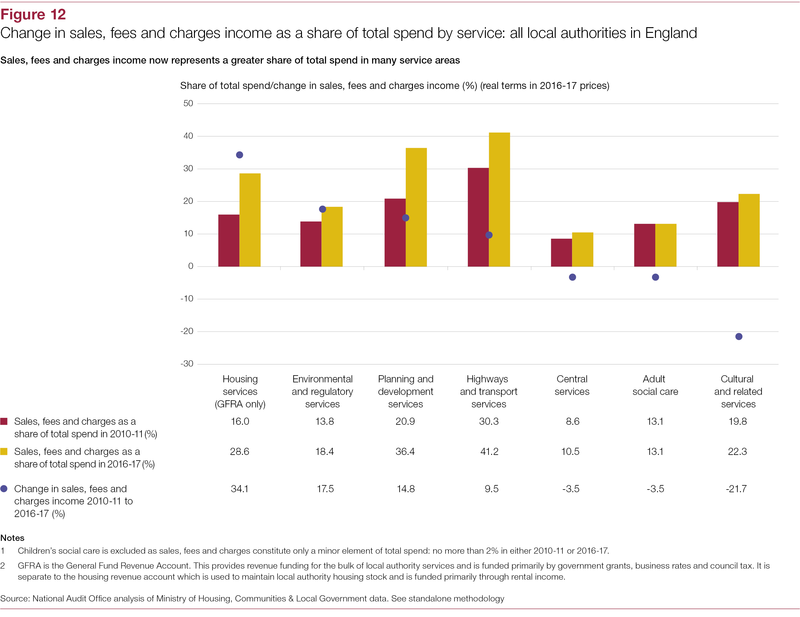 Part Two examines service sustainability by exploring changes in patterns of service spending and activity in local authorities. 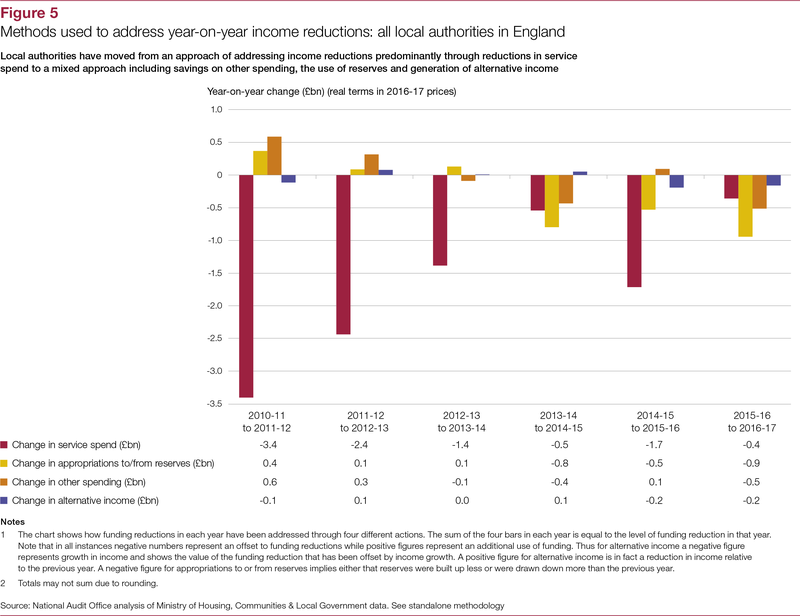 Part Three assesses levels of financial pressure and their implications for financial sustainability in the sector. 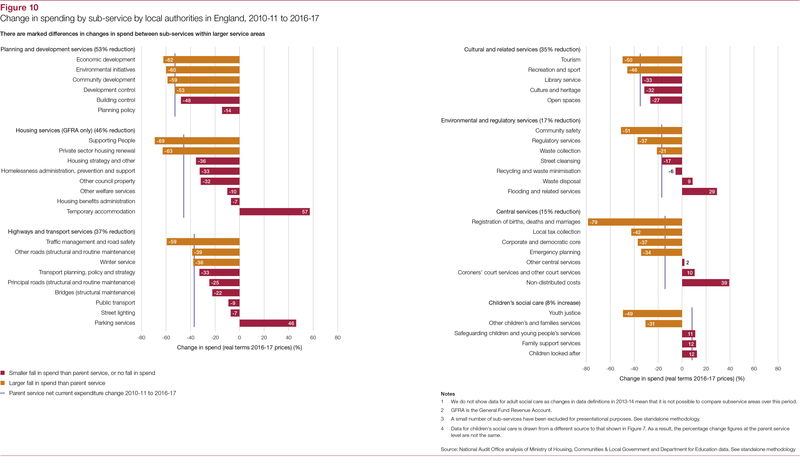 Part Four assesses whether the Department and other departments are sufficiently informed about the risks and impacts from pressures in the sector and are managing those risks. 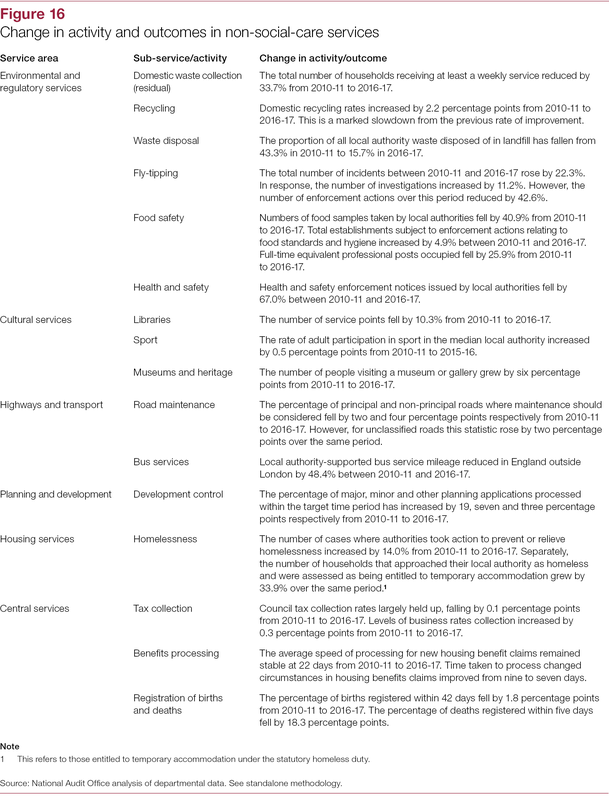 This assessment is informed by our independent analysis of risks and impacts presented in the preceding parts. 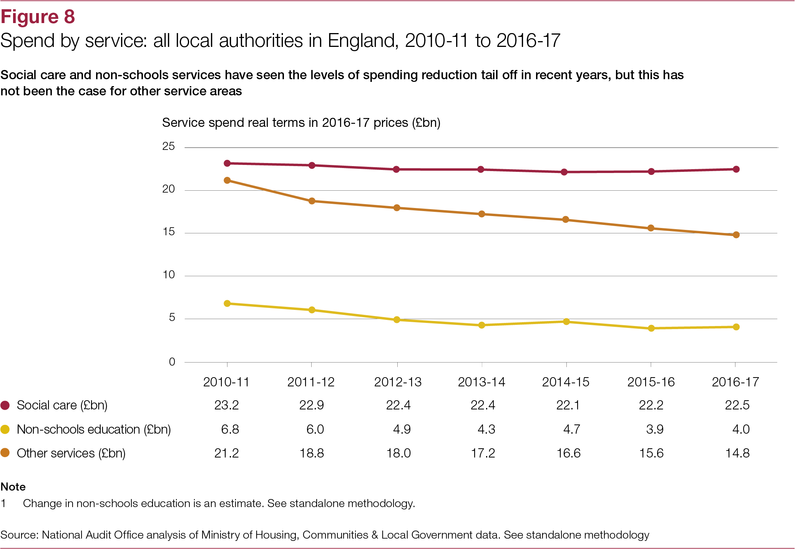 The sector has done well to manage substantial funding reductions since 2010-11, but financial pressure has increased markedly since our last study. 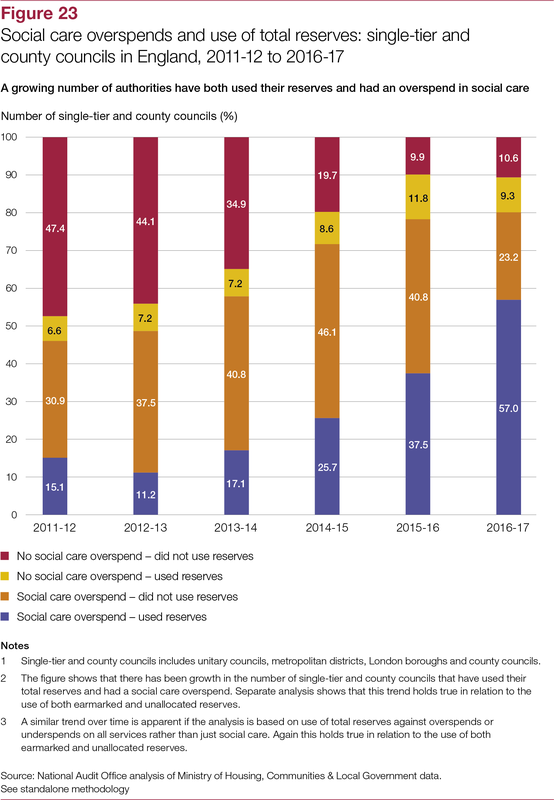 Services other than adult social care are continuing to face reducing funding despite anticipated increases in council tax. 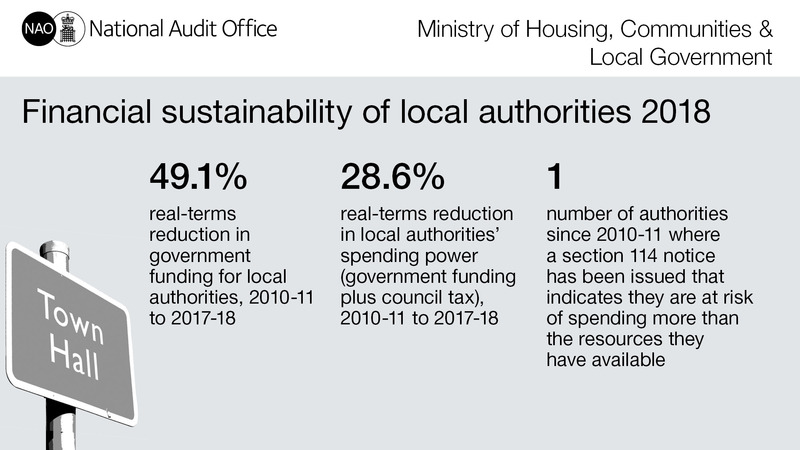 Local authorities face a range of new demand and cost pressures while their statutory obligations have not been reduced. 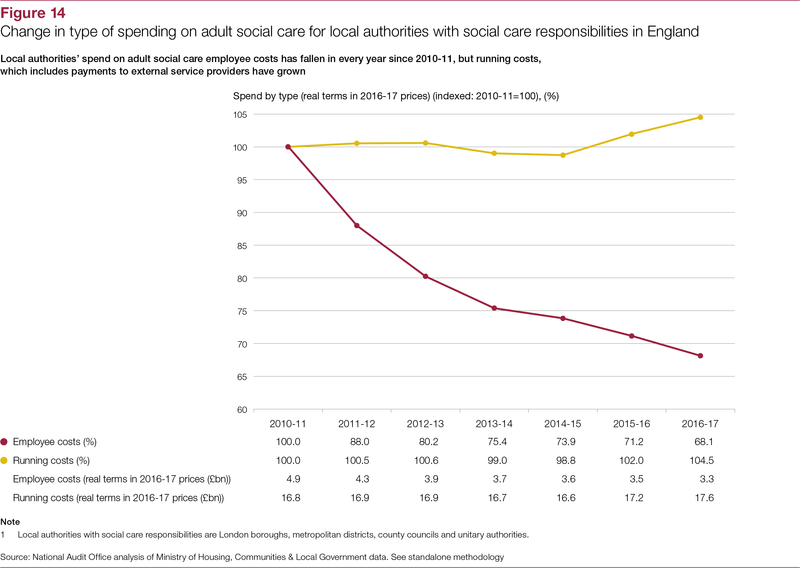 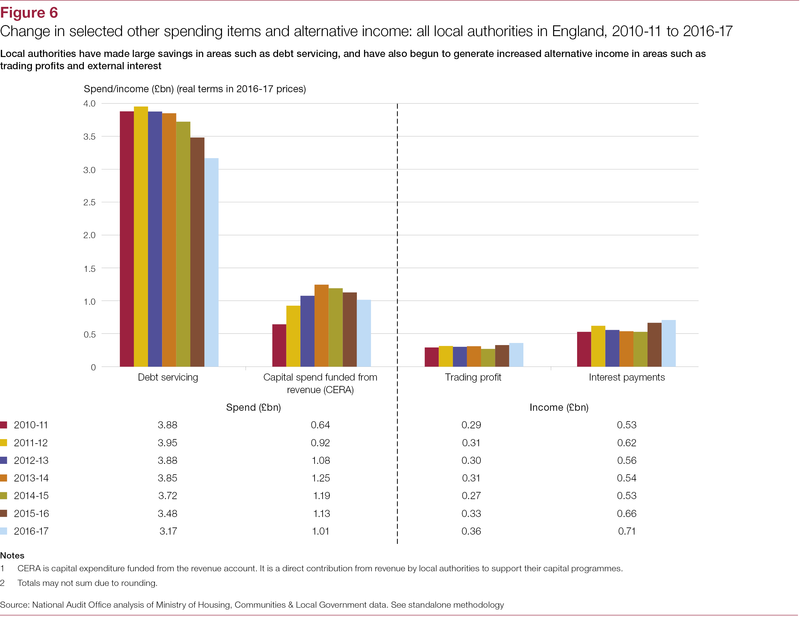 Non-social-care budgets have already been reduced substantially, so many authorities have less room for manoeuvre in finding further savings. 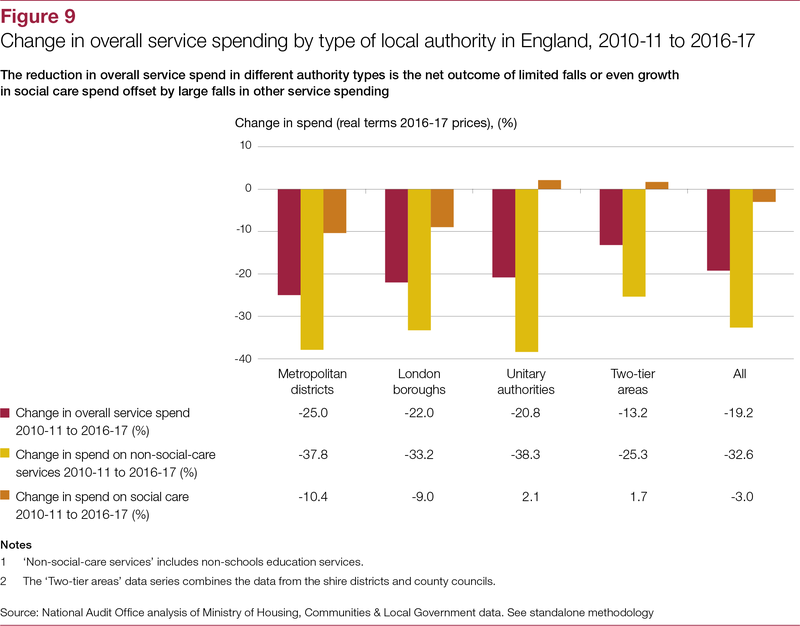 The scope for local discretion in service provision is also eroding even as local authorities strive to generate alternative income streams. 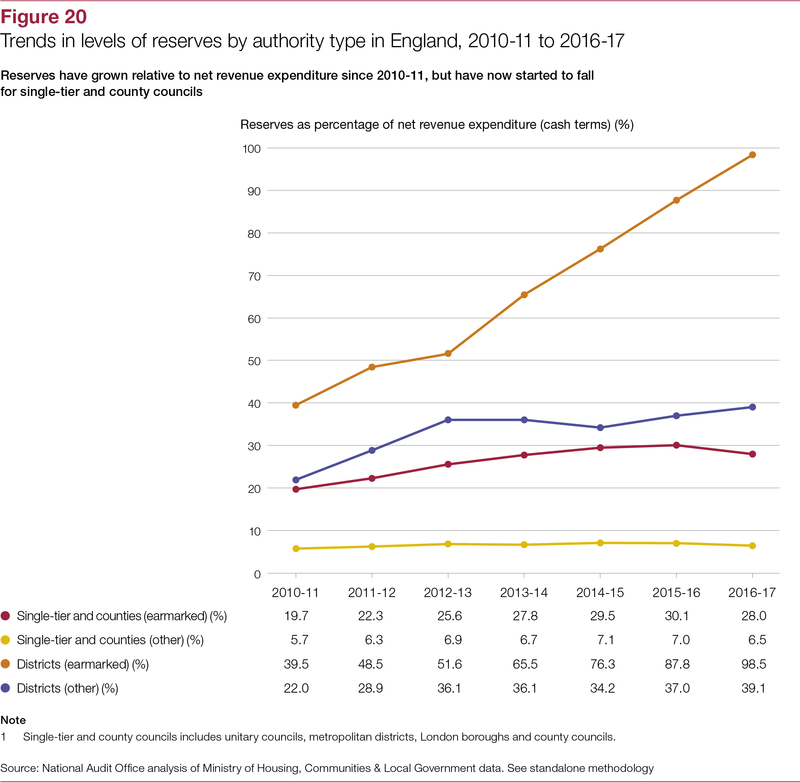 The current pattern of growing overspends on services and dwindling reserves exhibited by an increasing number of authorities is not sustainable over the medium term. 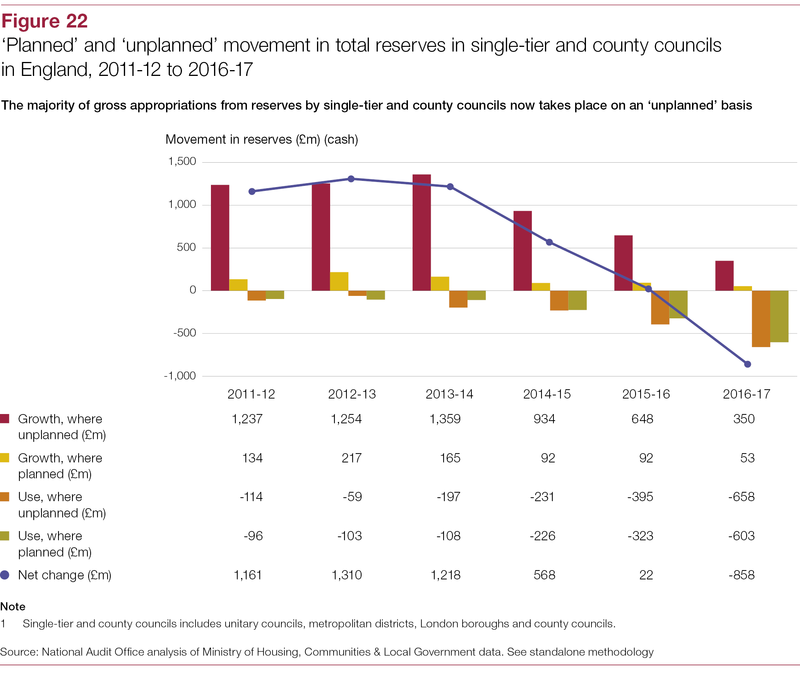 The financial future for many authorities is less certain than in 2014. 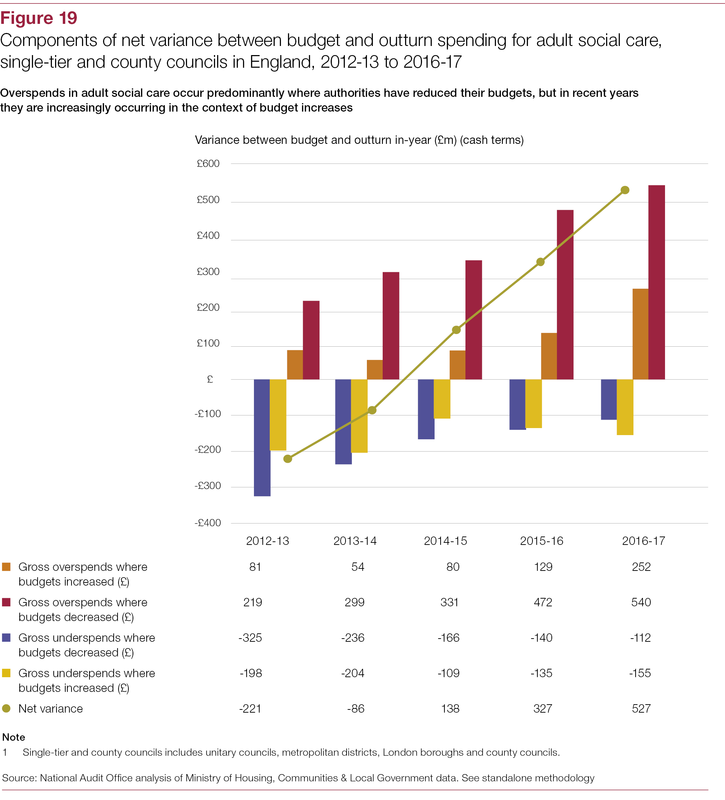 The financial uncertainty created by delayed reform to the local government financial system risks longer-term value for money. 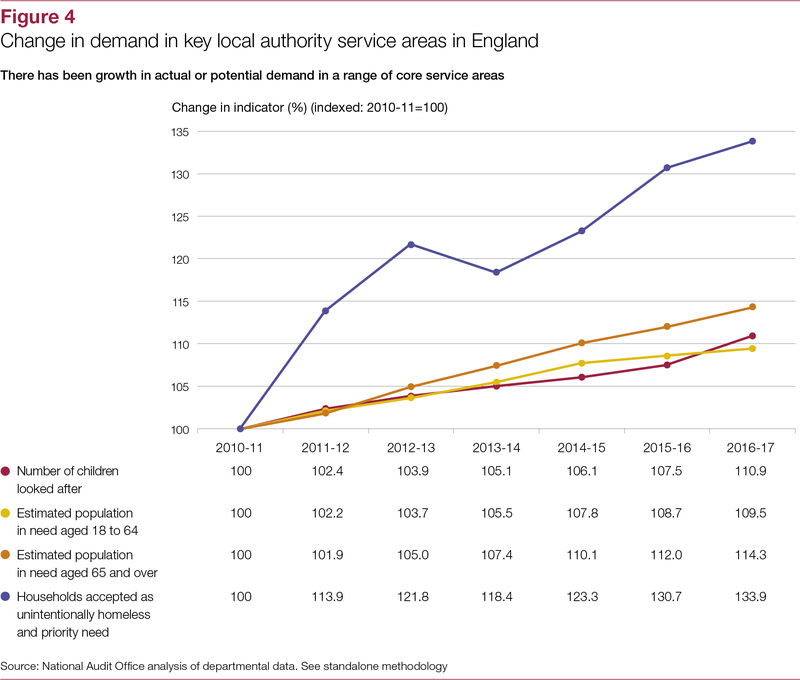 The Department’s performance has improved since our last study. 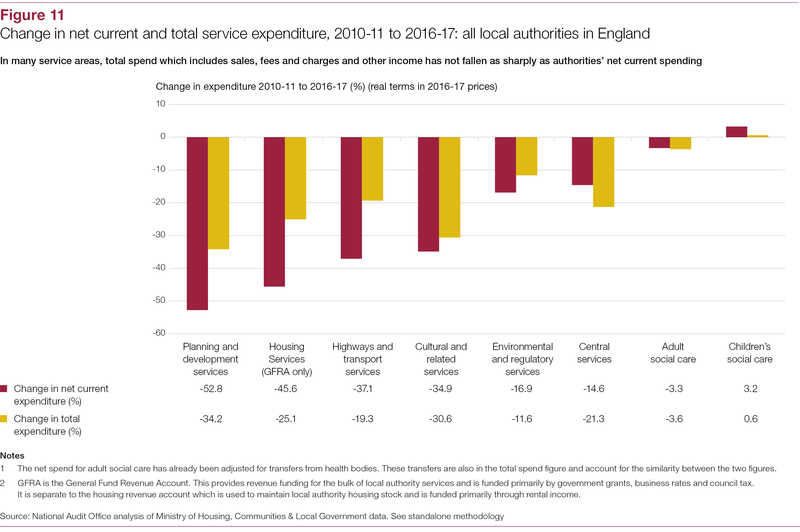 The Department’s work on the 2015 Spending Review was an improvement on its predecessors and the Department has improved its oversight of the sector’s financial sustainability. 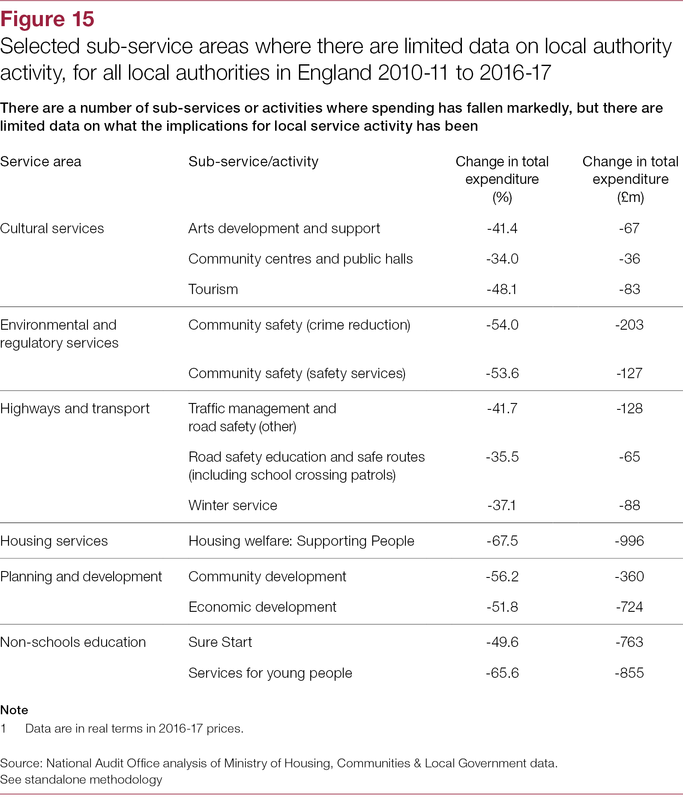 However, conditions in the sector have worsened and the Department must continue to strengthen its oversight and assurance mechanisms to protect against risks to value for money from financial failure in the sector. 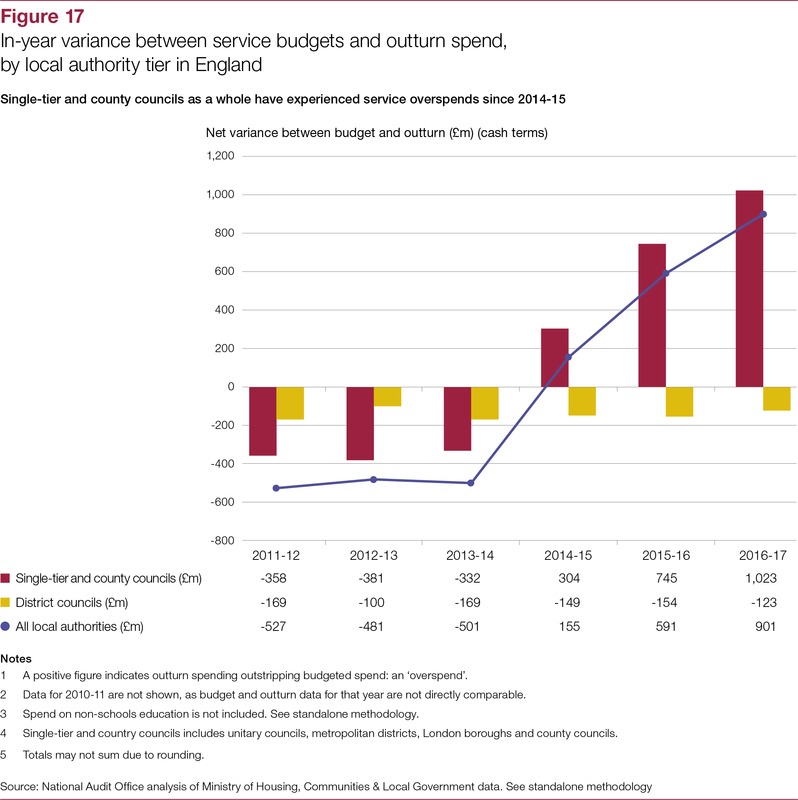 It must also set out at the earliest opportunity a long-term financial plan for the sector that includes sufficient funding to address specific service pressures and secure the sector’s future financial sustainability. 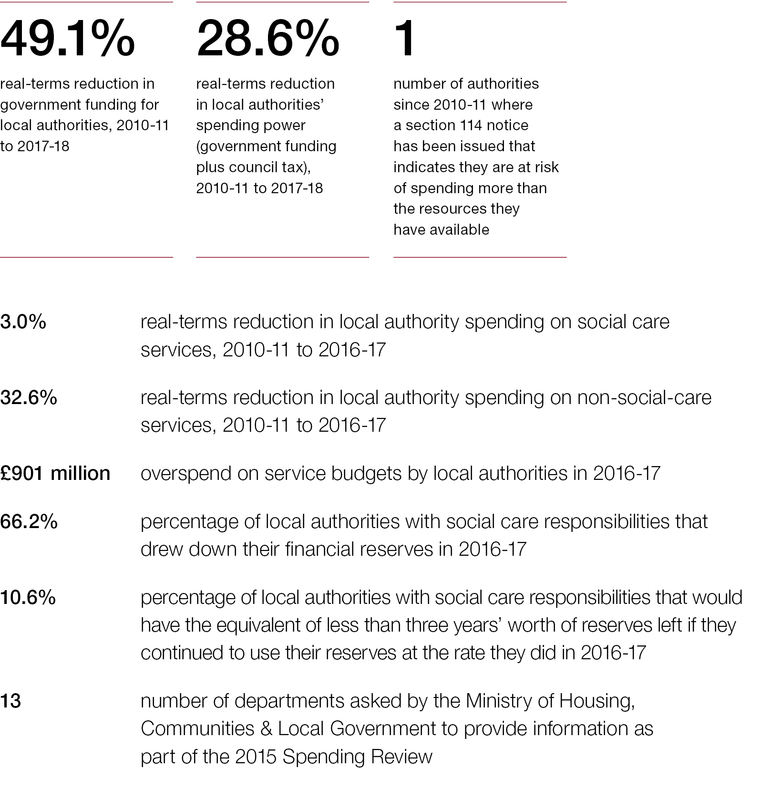 The Department’s capacity to secure the sector’s financial sustainability in the context of limited resources is shaped by the priorities and agendas of other departments. 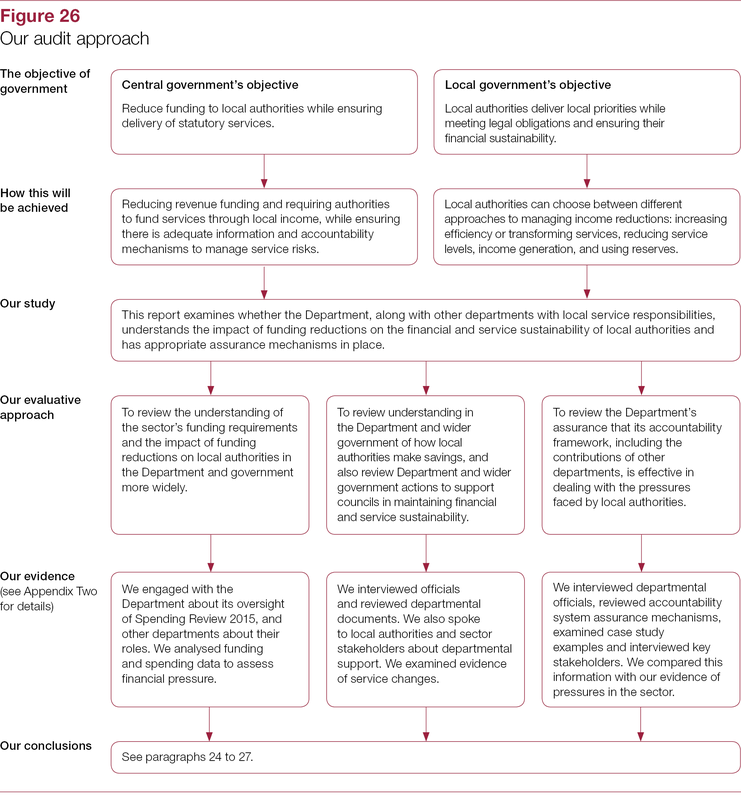 The Department’s improvements in understanding and oversight are necessary but not enough. 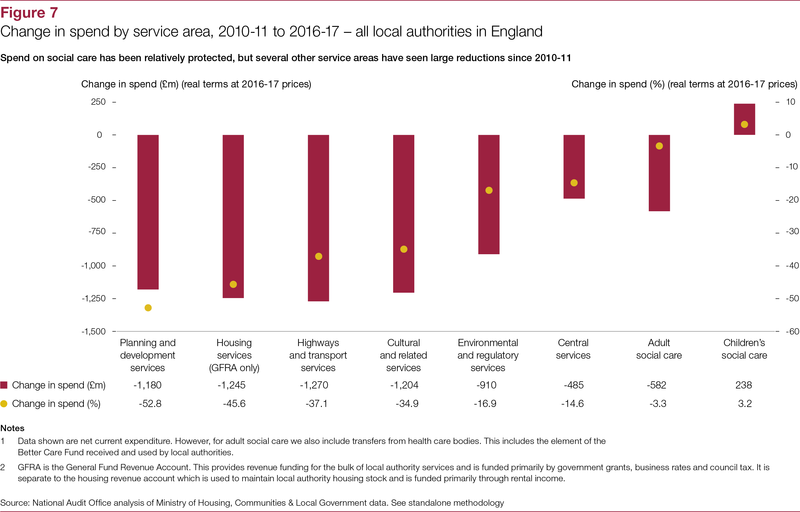 Equally, because responsibility for services is dispersed across departments, each department has its own narrow view of performance within its own service responsibilities. 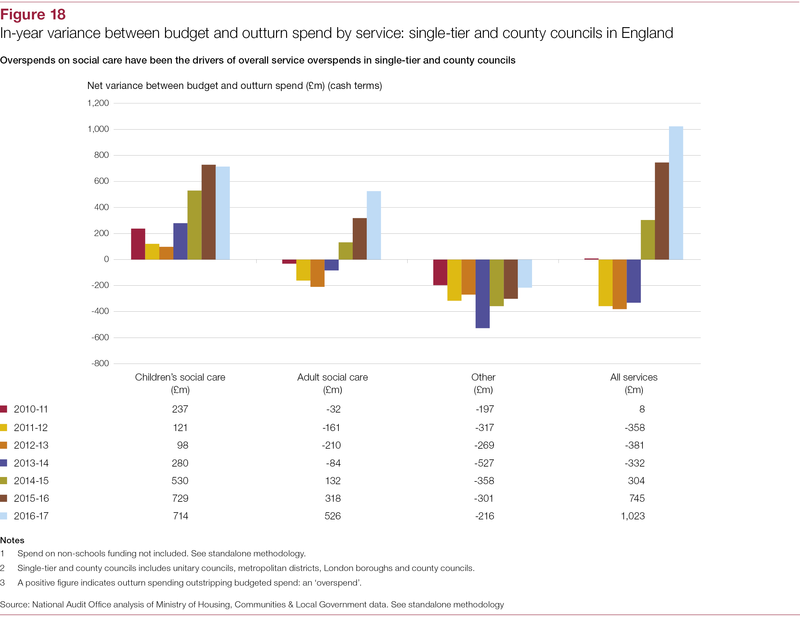 There is no single central understanding of service delivery as a whole or of the interactions between service areas. 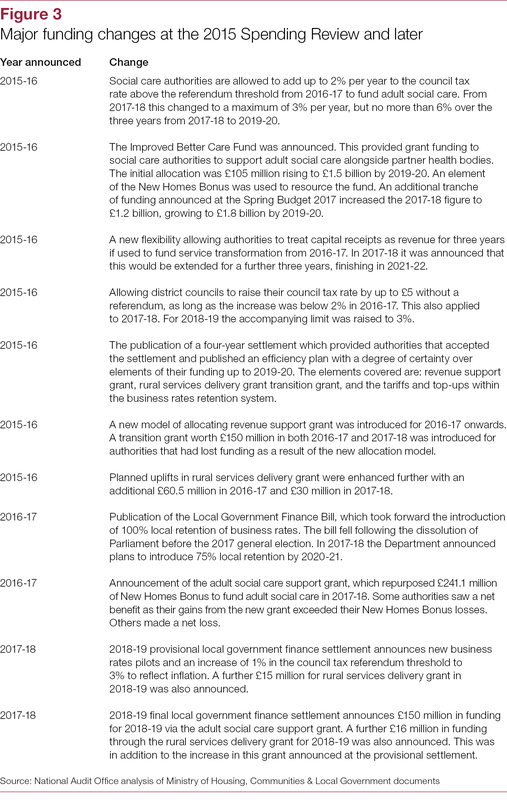 To date, the current spending review period has been characterised by one-off and short-term funding fixes. 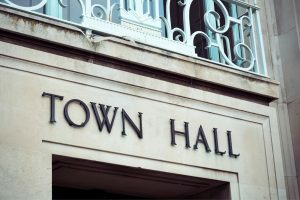 Where these fixes come with restrictions and conditions, this poses a risk of slowly centralising decision-making. 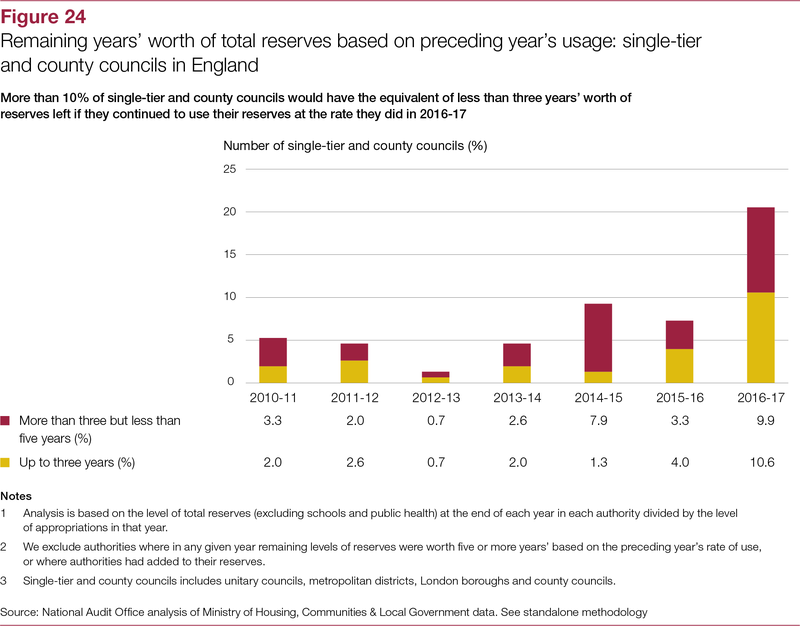 This increasingly crisis-driven approach to managing local authority finances also risks value for money. 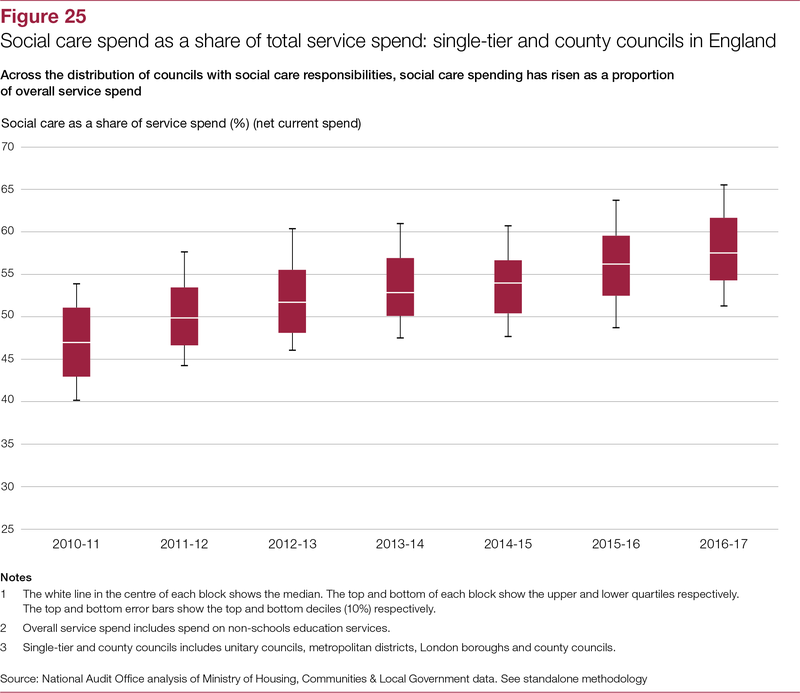 The current trajectory for local government is towards a narrow core offer increasingly centred on social care. 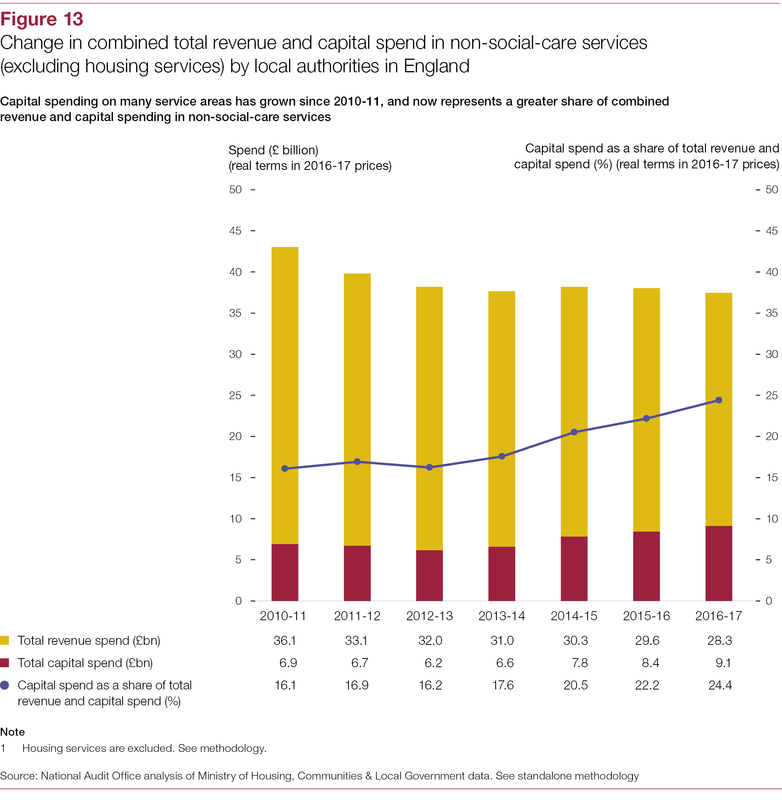 This is the default outcome of sustained increases in demand for social care and of tightening resources. 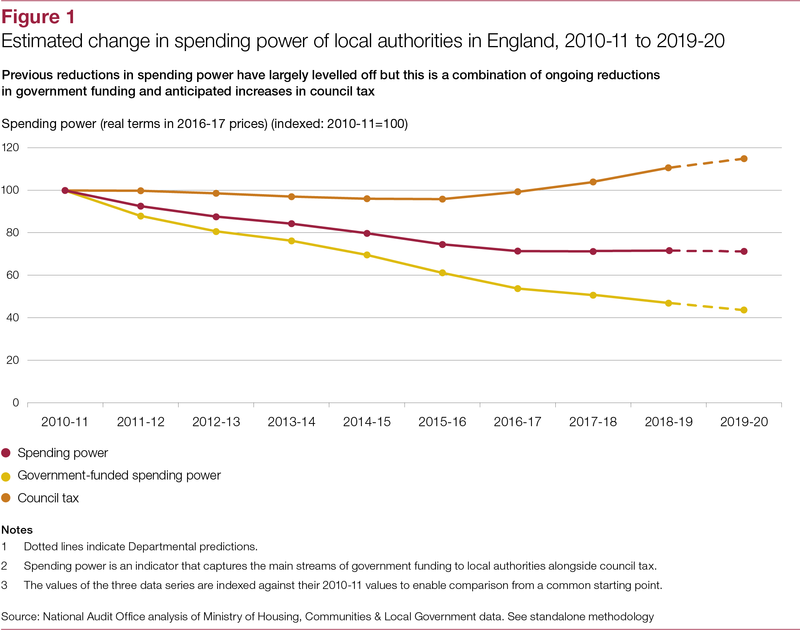 The implications for value for money to government from the resulting re-shaping of local government need to be considered alongside purely departmental interests. 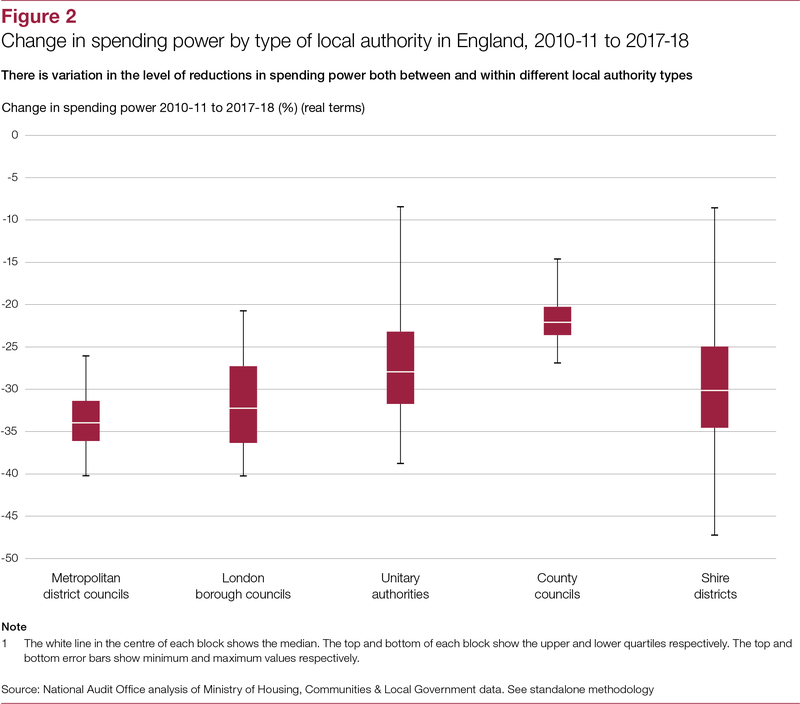 Departments need to build a consensus about the role and significance of local government as a whole in the context of the current funding climate, rather than engaging with authorities solely to deliver their individual service responsibilities.